1936 CALIFORNIA License Plates Pair Original DMV Clear YOM. 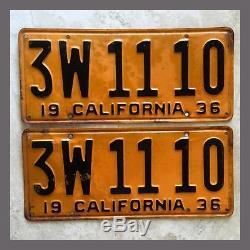 1936 CALIFORNIA License Plates Pair 3W1110. 1936 California YOM License Plates. Paint loss, paint fading, and a scrape across the 3W on one plate. Please ask questions and check picture(s) carefully before purchasing. We specialize in dashes, steering wheels, grilles, license plates, and all the associated trim, etc. Other original items include seats, fenders, running boards, and bumpers. We have engine and mechanical accessories, as well as a nice selection of print memorabilia, brochures, dealer books, and other hard to find publications. The item "1936 CALIFORNIA License Plates Pair Original DMV Clear YOM" is in sale since Tuesday, September 20, 2016. This item is in the category "Collectibles\Transportation\Automobilia\License Plates\US\ California". The seller is "40fordsteve" and is located in Santa Ana, California. This item can be shipped worldwide.